Eyedeal Graphics is pleased to announce the posting of another client website! This month, we launched a redesigned site for our client Morris Flooring & Design! At Eyedeal Graphics, we strive to fully understand each of our client’s project needs, based on each individual business. We never want to be sitting across the table from our customers, but instead strive to be on their side of the table, as a trusted member of their team. This is achieved through in-depth analysis, discovery and discussion at the very beginning of each project, both with the client and internally with our team. Our initial investigation for Morris Flooring & Design’s new website uncovered three prominent objectives. Create a modern and visually appealing website with a responsive interface for all devices sizes. 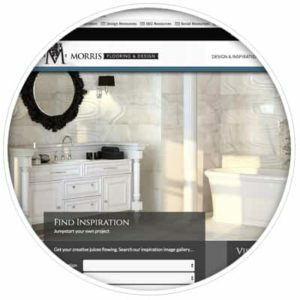 Streamline content structure enabling visitors to discover the core of the website, which are the beautiful photos of the quality flooring and tile that Morris is known for in the region. Design and call attention to an interactive, virtual showroom that both engages users during their current browsing session and informs prospective customers of the physical showroom that they can visit. The third objective was a major focus of this project’s development. A concern with the previous iteration of the site was a fragmentation of the featured product categories and the imagery found within each category. The content structure of this section worked well in theory, but proved difficult to navigate in practical usage. The designers and developers at Eyedeal Graphics worked together to deliver an effective solution, which is the new Design and Inspiration virtual showroom! The virtual showroom displays hundreds of photos of tile and flooring in a manner that is both aesthetically pleasing and easy for viewers to use. Our team also understood that it was important for visitors to identify and enter the showroom experience quickly upon their site visit. We designed the home page accordingly. Within a matter of seconds, and with one click, visitors can choose and review customized results! Additionally, we were also able to analyze the existing Google Analytics data, which allowed our team to make meaningful, data-driven recommendations indicating the most relevant content to be featured on the website’s home page. For those with a technical interest, the virtual showroom page was built with Angular, one of the latest and most up-to-date programming frameworks. This created a quick, responsive, and interactive user experience. Something that is becoming increasingly important in modern websites, especially considering all the mobile traffic. Angular is just one of many toolsets our developers utilize in website development. Our team is currently working on website projects for customers representing a wide range of industries and organizations. We looking forward to meeting the unique challenges and requests of our clients, existing and new. Contact us today if you are considering an upgrade to your website!